Superyacht agents were pleased this week to see the launch of a new website promoting the South Pacific as a new charter and cruising destination. Here, they discuss why the new website and alliance of Australia, Fiji, Tahiti and New Zealand will assist promoting the South Pacific, and reveal some of their best kept secrets in the region. “When in Pacific waters, visitors are part of the family. Visitors will experience unique Fijian, Tahitian, Aboriginal and Maori cultures as an insider. They’ll discover some of the freshest and most-exciting new cuisine on the planet. Adventure like a local in pure, awe-inspiring untouched environments – places so stunning, visitors would think they’d been photo shopped. Revel in the famed fishing, diving, and extreme adventure sports. A new website allows superyachts to navigate the South Pacific countries’ websites to gain the valuable information they need to make their cruising decisions. The website was launched this week by a cross-national alliance of Australia, Fiji, Tahiti and New Zealand, and showcases that the South Pacific offers everything the global superyacht fleet demands, with agents who are experienced, knowledgeable and ready to offer a huge welcome and the best of service. Etienne Boutin, of Asia-Pacific Superyachts Tahiti agrees with Carter. 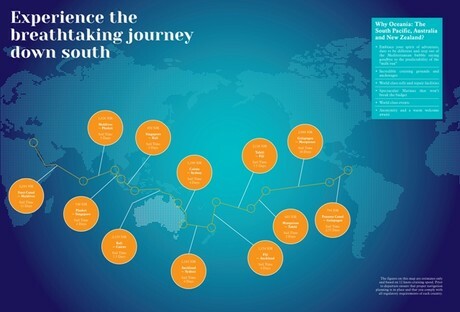 “The Asia Pacific Superyachts network of strategic locations looks forward to promoting the South Pacific Superyachting initiative and the South Pacific Region as a whole. The South Pacific is already a well-appreciated cruising destination in most people’s mind but what the SPSY initiative can achieve is to raise it into the select club of prime cruising destinations, which it belongs to by all standards: great sailing and exploring, fun activities for all, security, good support and top technical facilities,” says Boutin. “Agents provide detailed knowledge of the destination and a personalised service to crew and guests. In a destination like Fiji your agent can ensure your visit to Fiji is plain sailing. Asia Pacific Superyachts Fiji believes that the South Pacific Superyachting initiative will attract more superyachts to the South Pacific and we look forward to welcoming them when they do,” says David Jamieson, Asia Pacific Superyachts Fiji. “The launch of South Pacific Superyachting is another example of the marine industry and its commitment to offer reliable, experienced and dedicated suppliers and contractors to visiting superyachts. The formation of South Pacific nations to unite and encourage superyachts to the region will only benefit the area as a whole and give the superyacht captain and owner assurance that the support for these yachts is available from a reliable source. The formation will give strength and credibility to the destinations,” says Allan Jouning, director, 37 South. We are pleased to advise that our new website is now live at www.southpacificsuperyachting.travel with links to some of the respective countries’ marine and tourism websites for visiting yachts. The governments of the four Pacific nations of Australia, Fiji, Tahiti and New Zealand now have user-friendly rules that allow yachts to stay longer in each country, and passage from one country to the other is as simple as possible. The South Pacific also offers something of tangible value to charter yachts – an exciting, relatively untouched and very desirable location to add to their marketing mix and that’s something South Pacific Superyachting will be helping them achieve.